Go see a complete list of M5 peaks climbed in July 2005. How to get there: From Ajaccio, there are two routes of approximately the same length. One may head north-east on the main Hwy. N193 towards Corte, cross the col de Vizzavona and continue another 10.5 km, then make a right towards Col de Sorba on Hwy. D69. This road is quite narrow and climbs to the col with several hairpin curves. This col is 7 km after the turnoff. From the col, drive another 10 km to Ghisoni, make a right turn and continue 6.6 km to a road that forks right. This road has a sign saying Campi de Neve, Station de Ski, there is also a gate. Take this road and climb the hillside for another 12.5 km. You will arrive at a fork, however, both roads lead to a parking area. Consider taking the left branch (actually straight ahead), this road ends after 400 meter where there is parking on your right hand side. This is the trailhead, elevation 1590 meter, location N42:04.635, E009:09.050. 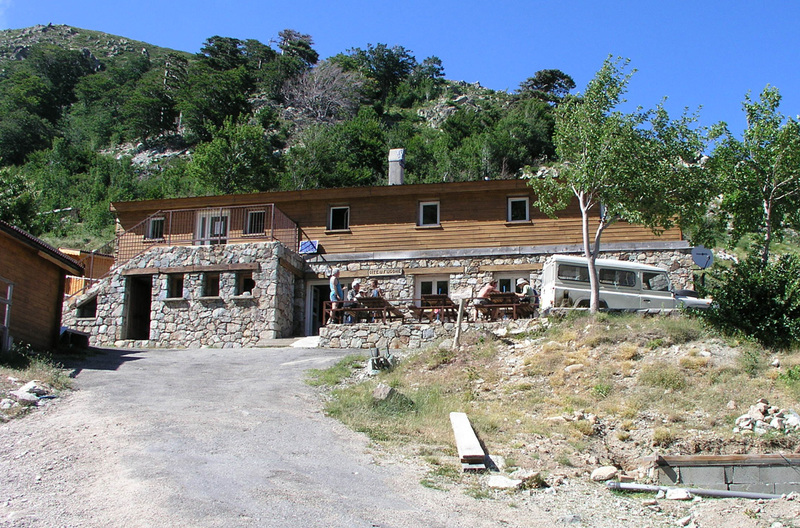 The other route is N196 from Ajaccio to Apa, then D83 to Cozzano, followed by D69 to Col de Verde and about 10.5 km further to the sharp left turn going up to the ski area as described above. Route description: From the parking, head up the first slope also served by a skilift. When you attain this ridge, make a gentle right and continue uphill on a trail that is well marked with numerous cairns. The trail first climbs a slope, then enters a more level area (a small basin) with a somewhat higher ridge on your left side. There are a couple of trails, but they do led to the same area. Take a trail that leaves the small basin and ascends the ridge (south slope) on your left. When you gain this ridge, the nice lake Bastani is between you and the summit. The route is YDS class 1 to this point, from here to the summit is still very easy, but YDS class 2 terrain. A fairly clear ridge is coming down towards you on the right (west) side of the lake. Continue up the lower part of this ridge, but when it gets slightly steeper, follow a trail or cairns off the ridge to your right (west) and into a broad gully with scree and loose rocks. Hike up this gully, the gully will narrow higher up and eventually becomes very narrow, but with good rock. Go up this passage a few meter until the gully again becomes a bit wider, then easy on the trail to the top of the main ridge above you. From here, the trail is almost completely flat crossing a very level area, then gently uphill among rocks to the summit ridge. Stay left in order to climb the highest point first. 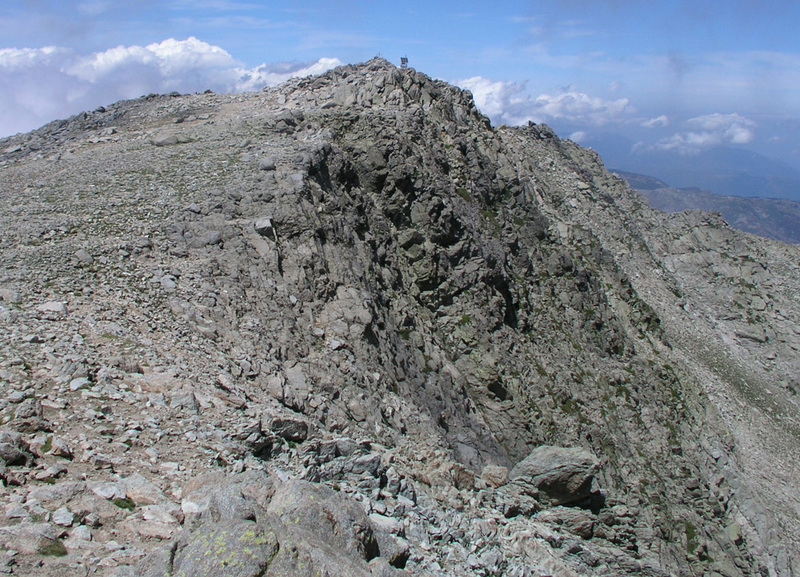 The summit ridge has three distinct high points, the first (NE on the ridge) is the highest. The middle point has a solar panel, while the third point (SW on the ridge) is the second highest. 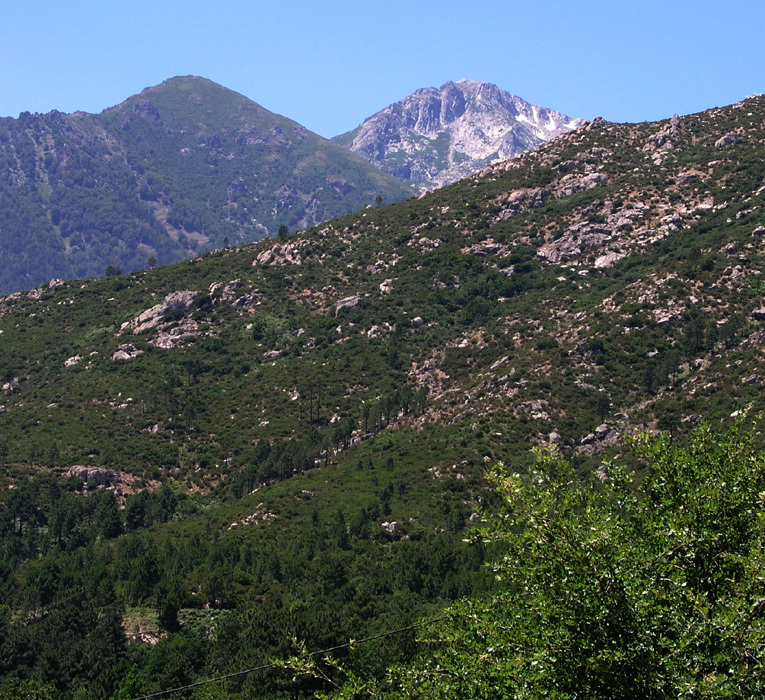 Comments: I did this climb as a first "get to know Corsica" experience. The ascent from the car took 1:15, I spent 30 minutes exploring the summit ridge, then 50 minutes to descend back to the car. The drive from Piana (where we were staying) took almost 3.5 hours each way, I tried two different roads, they were both quite long. M5 continued the next day with Monte Rotondo. 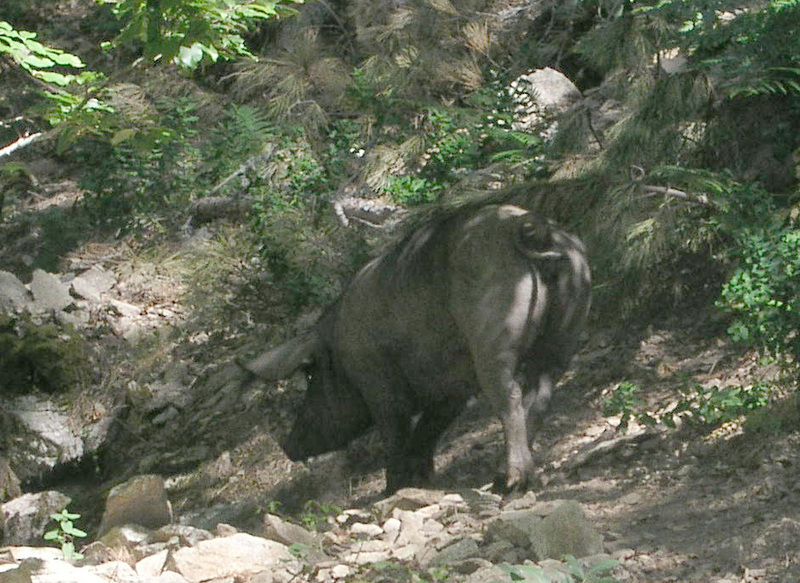 Wild pigs can be seen lower down in the forest. Monte Renoso seen from the valley. Monte Renoso as seen from the trail below lake Bastani. Monte Renoso the easiest route follows the gully near the rightmost edge of the picture. 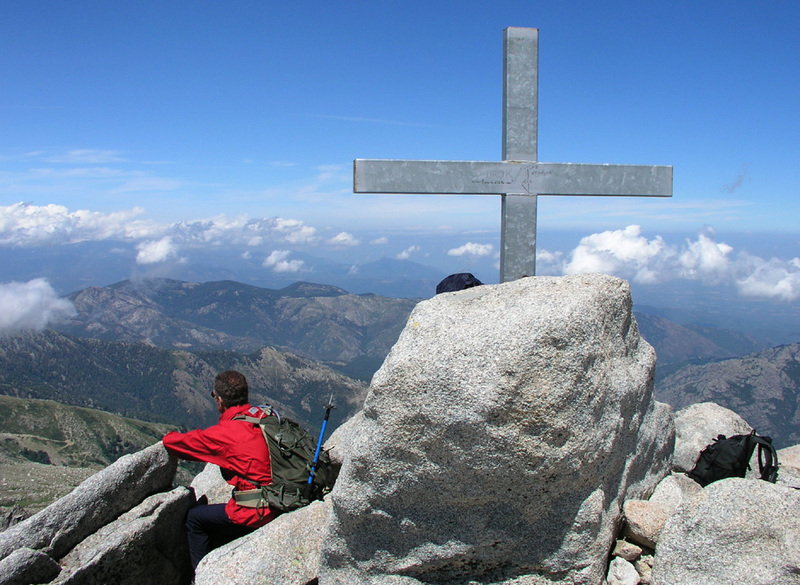 The middle Renoso summit seen from near the east summit. Summit view along the top ridge. 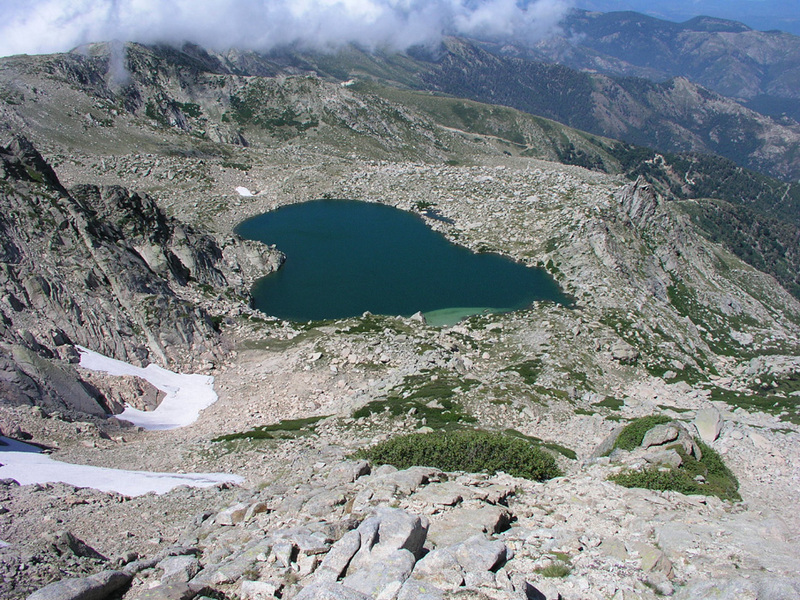 Lake Bastani, the trailhead is seen further down. The Refuge at the trailhead. Corsica landscape on the way home from Renoso.